Ellipsis is a hero (or maybe anti-hero) created by Scott Eiler. Stephen Samuel Wolcott's birth certificate reads "Rochester, Indiana, January 1970." But he was actually born in the extra-dimensional realm of Hypergaard in December 1969. His mother had been abducted there, as part of a plot to collect superhuman children. He briefly showed a wide range of Ellipsis powers before the incident was over. Stephen was raised solely by his mother, Marian Wolcott. She was of poor health, and died in 1987, at the start of his senior year of high school. By that time, Stephen was able to express his mental power as subconscious mind control, to avoid being taken to a foster home. Instead he lived quietly in a room at a cheap hotel, in exchange for cleaning rooms. He finished high school that next spring, and went to Michigan State University on full academic scholarship. There he studied so intently, he completed a four-year degree in three years. Through the 1990s, the adventures of Ellipsis lend themselves to a timeline. Highlights are shown here. Links to original Ellipsis stories are provided where those stories still apply. Formation of the Balance: October 1990. During Stephen's final year in college, he and three other young superhumans were brought together by a plot of the armored villain Domesday to capture a sample of the rare mineral "Unobtainium". They successfully kept the mineral away from him, and continued to work together and with other young heroes as "The Balance". During that period, Stephen met his future wife Julie Moretti (Julie Wolcott). The Ellipsis Field: May 1991. Stephen arranged to join the university's project to study the Unobtainium. He and two professors developed a way to use it to generate biologically-based energy fields - with themselves as test subjects. But the power had bad effects on their mental stability; the two professors rioted, and Ellipsis and the Balance had to subdue them. Thereafter, only Ellipsis was able to safely wield the power. Ellipsis leaves the Balance: June 1991. He and Julie had graduated; both got jobs in New York City. Terrorist assault on Manhattan and the "Great Wrath of Ellipsis": August 1991. After the Persian Gulf War, the Iraqi leadership had gone into exile, with most of their country's financial reserves plus an unexplained stash of high technology. Soon after, a worldwide terrorist organization called the Iraqi Allied Peoples' Front arose. Its first action was to take hostages in several locations through Manhattan, simultaneously. Stephen Wolcott and Julie Moretti were among the captives. When one other captive rushed the captors, they opened fire; Julie went into shock from a flesh wound. Ellipsis, enraged, subdued his roomful of terrorists mentally - then left the building and did likewise throughout Manhattan. Ellipsis's control over his power was beginning to crack. Ellipsis in space (the "Doombreaker Incident"): August - October 1991. The "Great Wrath of Ellipsis" ended only when he was abducted by saucer aliens. They took him and one other superhuman to an alien planet, to confront a space conqueror named Urr. Urr at one time caused the Ellipsis Field to consume Ellipsis's body - but Ellipsis reconstituted his body, with increased power and control. He then defeated Urr, and the aliens returned him to Earth. Ellipsis vs. the Balance: October 1991. The U.S. Government had enlisted the Balance to rein Ellipsis in. After a confrontation in Manhattan, they convinced him reluctantly to submit to detention for study. Ellipsis in U.S. government captivity: November - December 1991. At the facility where Ellipsis was detained, extradimensional electrical beings invaded. Ellipsis made peaceful First Contact with them, then took advantage of the facility's power outage to contact the outside world and arrange his release. Ellipsis in time-travel incident: February 1992. Agents of a future dominated by Ellipses came back in time to neutralize him. If nothing else, this gave Ellipsis a sense of destiny. Stephen Wolcott marries Julie Moretti: April 1992. They married in Nevada, and split their honeymoon time between Las Vegas and the desert. These stories diverge from the original published history of Ellipsis. The divergence point was when Stephen and Julie Wolcott began to recruit new allies. This team was called Total Conversion. Its existence basically made Ellipsis the first world power primarily based on superhumans. In 1996, Ellipsis and Total Conversion defeated the United States. But later, other superhuman powers arose and went to war with Ellipsis. By the end of this war, Ellipsis and his wife had been banished to a pocket shadow-Earth. By 1999, yet new heroes were rising whom Ellipsis had not yet tracked. One of these (one Wyatt Ferguson) helped two of Ellipsis's old allies rescue him and Julie from captivity in the pocket-Earth. All the world's heroes, villans, and human residents then banded together to save the real Earth from an existential threat - the space conqueror Urr whom Ellipsis had once defeated. Stephen and Julie Wolcott rebuilt their Total Conversion Foundation in Kellyville, Greenland in 2000. In 2001 they responded to yet another terrorist attack on Manhattan, with tacit U.S. blessing. There Julie lost her Scudbuster armored suit, which was then used to bring down the World Trade Center. In the background of some other adventures, Stephen Wolcott spent the next few years scheming alongside small independence movements: Greenland in 2000, Keewatin in 2003, and the Aleut Republic and Patagonia in 2004. However, Patagonian independence touched off a South American war and a worldwide political and personal backlash. Stephen and Julie separated, and Republican candidate Orrin Hatch won the U.S. Presidential election. Stephen then removed himself from Earth entirely, and barricaded his homeworld to prevent the rest of Earth from following him. After an interdimensional incident, he disappeared even further. In 2005, Ellipsis's home Earth underwent a series of reality shifts. This prompted Ellipsis to return, under the guise of "X the Unknown", and remove most superhumans from the Earth before the shifts. X himself was captured, and transformed into a deejay known as Ellipsis Z. Only in 2006 did Ellipsis get his full powers back. He soon reunited with Julie and his old teammates of the Balance, and spent two years with them running a mystical dream kingdom. By 2008 Ellipsis had returned, and was willing to be drawn into greater superhero alliances. He consulted with a group called "The Combine", and eventually became a National Science Advisor to the U.S. Vice-President. Ellipsis was central to the world superhuman response to the Global Cooling crisis of 2011. But he eventually fell away from other superhumans, when he declared the Ellipsis Field to be open source technology. He, Julie, and a few others now operate from Western Australia. Stephen Wolcott appears distant to most people. Indeed, he doesn't even like most people. But he can be remarkably social, especially to people whose powers or intellect he respects. He is happily married to Julie (Moretti) Wolcott. Stephen's belief system is hyper-libertarian. He sometimes cooperates with governments at times of shared necessity, but usually he and they do not trust each other. Still, his libertarian beliefs usually prevent him from directly interfering with most people and their minds. Stephen's concerns are largely scientific and engineering. For instance, he developed a user interface "EllipsOS" as an offshoot of open-source Linux. This system was installed on "TCF" brand computers in the '00s decade, and possibly after. EllipsOS anticipated some user interface innovations that major corporations would implement later. Stephen Wolcott was largely unable to counter these measures, due to his various incapacities in the '00s decade. But he did not care. His work was open-source, after all. However, Stephen is mostly concerned with the fate of society. He hesitates to interact with humanity in general. But he does not hesitate to do things which may program humanity to be more pro-social. In the modern era on his world, he is a major source of internet memes against his dystopian world leader, President Trump. It practically takes the Devil to counteract him; Russell Anvernacht (now the Legs of Satan) is his major online opponent. Stephen Wolcott is a mutant supergenius, with near-total control over his own mind, and extensive telepathic ability to interface to other minds. He can surround himself partially or totally with an energy field, which can totally convert mass to energy or vice versa. He has learned to use these powers in almost any conceivable manner. For instance, he can transmute elements, fly, survive in space, create force fields, teleport under his own power, and enhance his strength to at least mid-level superhuman. In addition, Wolcott has martial arts training; despite a lack of practical experience, he can call upon this training at need. He is his world's leading practitioner of weird science (concentrating on advanced programming), and coordinates with other scientists and programmers throughout the world. If he finds himself unable to use his telepathy or energy powers (for instance, as the deejay "Ellipsis Z"), Wolcott can compensate with technology. As Ellipsis Z, he was able to calm people using subsonics and a soft hypnotic voice, or drive them crazy using hypersonics. In short, Stephen Wolcott is nearly everything one can imagine someone called "Ellipsis" to be. Stephen Wolcott is tall and thin. His voice is flat but intense and somehow compelling. He has bushy dark brown hair, a double-pointed beard, and eyes with white irises on black background. He favors a white turtleneck sweater, light-colored pants, and a yellow jacket. 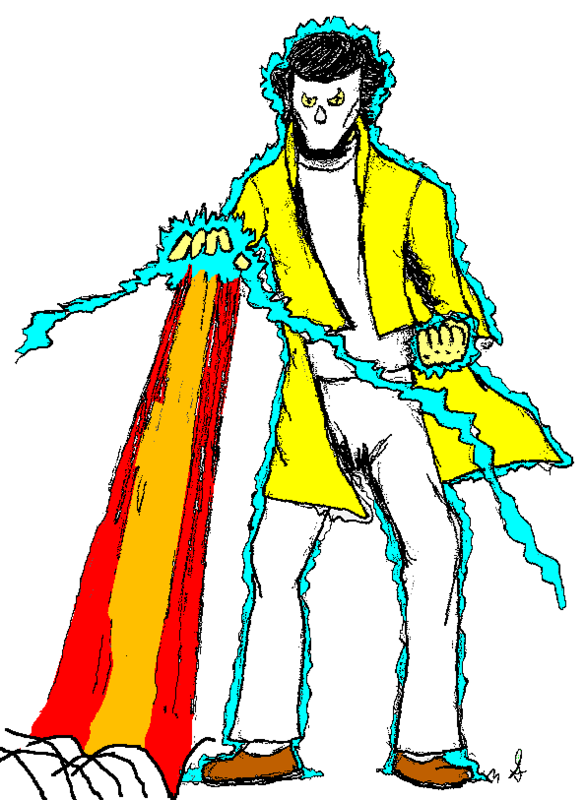 As Ellipsis he also wears an expressionless white mask, and is surrounded by a glowing energy field. Ellipsis is one of the three pillars of the Superhuman World, along with Wyatt Ferguson and the Powernaut. Ellipsis provides most of the 1990s history. This was interesting enough when Wyatt Ferguson first integrated with it. Now the Powernaut is, but that's working both ways - as witness the Hypergaard Incident. This history is meant to be definitive - so as to say which moldy old Ellipsis / Balance stories count as Superhuman World history. So, consider this stuff a resource for future crossovers. And enjoy! (signed) Scott Eiler, 15 May 2015.
heh, I've now brought in EllipsOS and President Trump. I will never refer to the real world Donald Trump as an acting United States president, because I copyrighted "President Trump" in a 2011 apocalypse story. So there. (signed) Scott, 2 February 2018. This entry and all characters within it are copyright © 2015 by Eiler Technical Enterprises.